The safety of its participants is of paramount importance to USA Hockey. 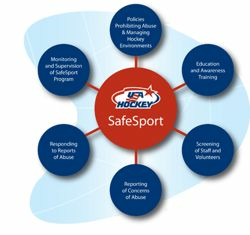 USA Hockey SafeSport is the organization's program related to off-ice safety. USA Hockey has long had systems in place to protect its participants from physical abuse, sexual abuse and other types of abuse and misconduct that can be harmful to youth hockey players and other participants.